If you have ever searched for any information in the internet, you have probably come across Wikipedia. Being the biggest resource of information online, this is the place where you will find basic facts about (almost) everything. Now, it’s time for an odd question – have you ever thought about creating a Wikipedia site of your own? Provide all the necessary information about an industry etc. These are some popular reasons why you might want to create a wiki site of your own. If you want to create a fully functional Wikipedia like site, WordPress will be the most suitable choice for you. 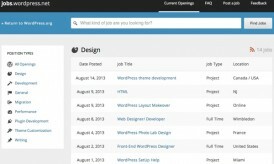 WordPress began its journey as a simple blogging platform. But the continuous development and upgrades have made it possible to create any type of website in this platform. Thanks to the countless themes and plugins, you can easily implement any design or add any feature in your website. In today’s post, I will discuss both of these methods. But first, let me clarify when you should use a theme and when to go for a plugin. 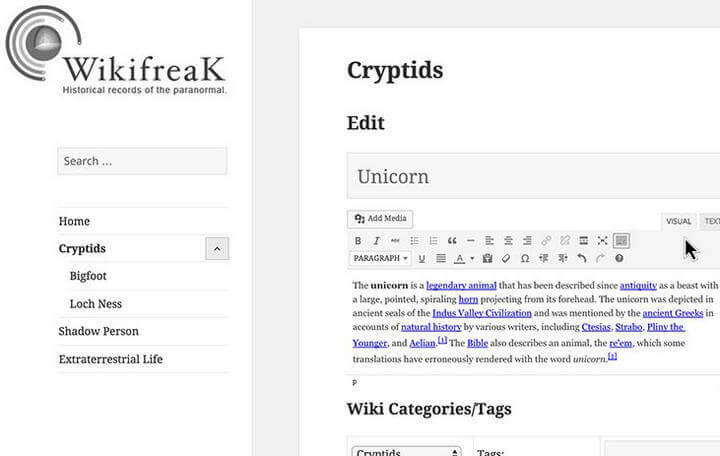 Should You Use a Theme or a Plugin For Creating WikiPedia Site? If you have an existing website and want to add the wiki feature, it is practical to choose the plugin solution. This will allow you to retain your current design and still provide all the information in a structured way. On the other hand, if you are creating a brand new website which is intended to provide information, you should choose a suitable theme. This will allow you to create a professional information site with all the necessary features in place. Now that you know the advantages of these solutions, you can choose the one according to your requirements. Let’s take a look at the best themes for creating a Wikipedia like site in WordPress. 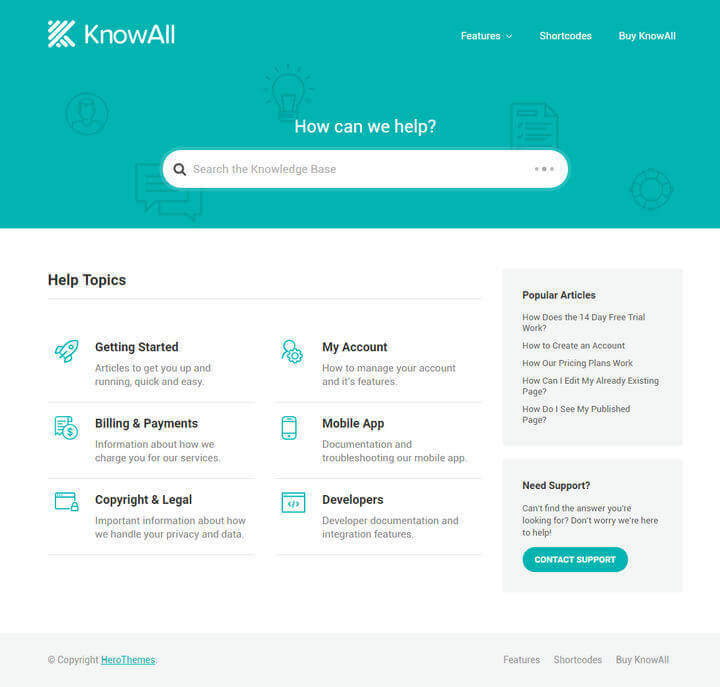 KnowAll is a professional WordPress theme developed especially for creating wiki or knowledge base sites. It allows you to create different categories and unlimited entries under each category. The handy search bar on the home page will help visitors find out any information they are looking for. Thanks to the AJAX-based system, users will be able to see relevant answers as they type their questions. The easily customizable theme allows you to apply all branding styles in your website. You can upload custom logo, choose any color scheme and a lot more from the built-in options panel. The fully responsive theme will also make sure that your website works perfectly in mobile, tablet and laptops. Built-in detailed analytics is another interesting feature of the theme. The analytics dashboard makes it very easy to keep track of your improvements. More importantly, the search analytics will inform what type of information your users are looking for. And the article feedback feature will allow you to find out the effectiveness of your wiki entries. You can get KnowAll for $99. KnowHow could be an excellent choice to create wiki or knowledge base sites in WordPress. 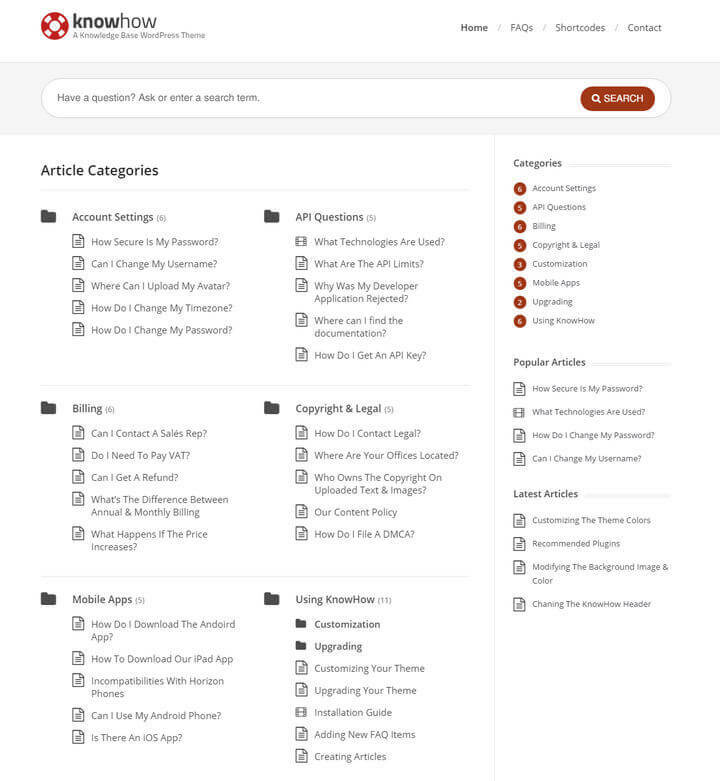 If you want to create a resource center for your product or service, you will find this theme very useful. Thanks to the adaptive layout, the theme makes sure that your website looks great on any screen resolution. And the AJAX live search provides instant answers to your visitors as they type their questions. These days, SEO has become an integral part of any modern website. And KnowHow complements your SEO efforts with its semantic codes and intuitive user interface. If you want to provide information in other languages, KnowHow has got you covered too. As the theme package comes with the po and mo files, you can easily create website in any supported language. KnowHow is priced at $49. Knowledge Base makes it very easy to provide your customers with all the necessary support for your products or services. 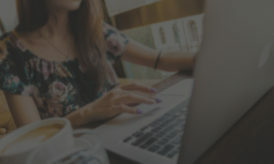 With the help of this theme, you can create a live support website which will act as a live support desk for your brand. The live article search feature will allow the visitors to search for their desired information. If they like the content of an article, they can upvote it. Knowledge Base also comes with built-in social sharing support, which means visitors can easily share any content they find useful. Support Desk is another WordPress theme which could be used to create awesome wiki, support or knowledge base websites for your audience. The attractive design of the theme looks great on mobile and tablet devices. Being fully compatible with bbPress, the theme allows you to integrate a fully functional forum in your website. The built-in FAQ page will be useful to provide answer to the most common queries of your customers. The highly optimized Support Desk theme is fully capable of boosting your SEO efforts. It also works perfectly with popular SEO plugins including Yoast SEO. As the theme package comes with both the po and mo file, you will also be able to translate your website into any other languages. What’s more, the integrated theme options panel allows you to customize all the visual aspects of your website from one place. There are also custom widgets and lots of shortcodes. You can get the theme for $59. If you want to create a simple but functional wiki or knowledge base site, Flatbase should be one of your top choices. 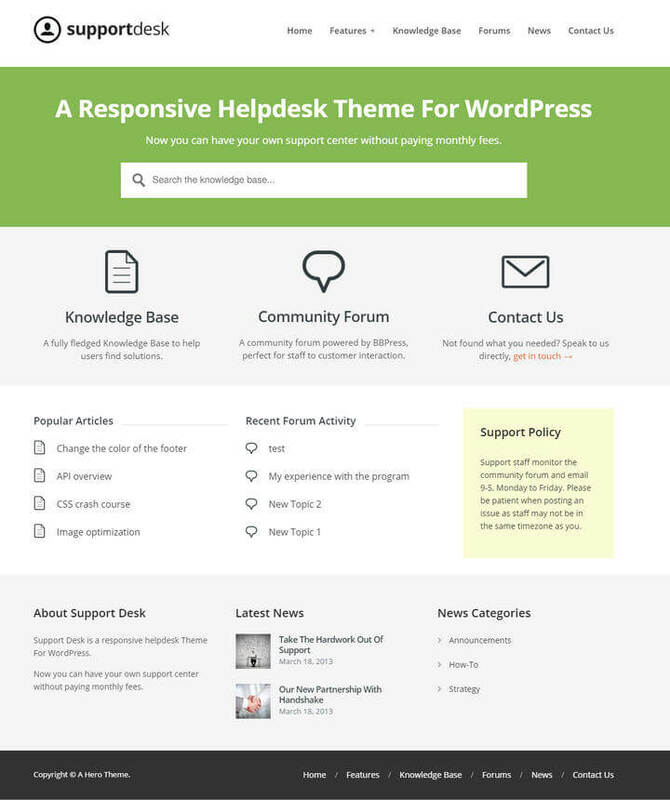 This excellent theme will help you provide the necessary help and support to your audience in a convenient way. The professionally designed theme features all the necessary options like FAQ, forum, and unlimited customization options to create your own support website. The AJAX-based live search will enable the users to get instant answers to their questions. And for the common questions, you can choose any of the two FAQ styles – accordion style or traditional list style. The live customizer allows you to change the visual options and check out the actual preview at the same time. The fully responsive and retina-ready theme is designed to look great on various screen sizes along with higher resolution screens. Other interesting options include reading time for each article, several widgetized locations, multiple layouts, Google fonts support etc. You can get Flatbase for $49. So far, I have only discussed about the themes. But as I said in the beginning, there are lots of WordPress plugins which can also help you create a wiki or knowledge base website. Now, let’s see which the best plugins are for this purpose. 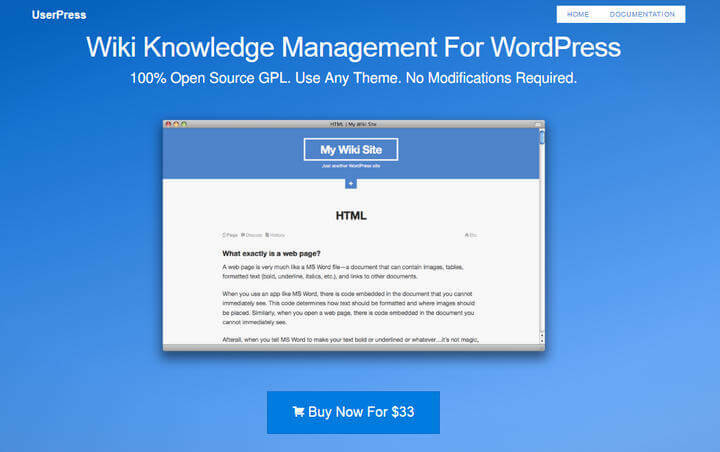 Developed by WPMU Dev, Wiki Pro is a premium WordPress plugin for creating wiki, knowledge base or support websites. This feature-rich plugin allows you to add and edit content from the front end. And if you want, you can allow the unregistered visitors to add information in your wiki site. Regular posts could be enhanced by using audio, video and image files. Thanks to the complete revision history feature, it is easy to revert back to any previous version of your posts. It is also possible to control the user access level according to their roles. Being fully compatible with BuddyPress and WordPress multisite, the plugin makes it a perfect choice to use in different situations. There are 7 custom widgets for displaying popular wikis, latest wikis, tags, categories, tag clouds etc. in the sidebar or footer of your website. You can get the plugin by becoming a WPMU Dev member, which starts at $49 per month. There is also a free version of the plugin with limited functionalities. 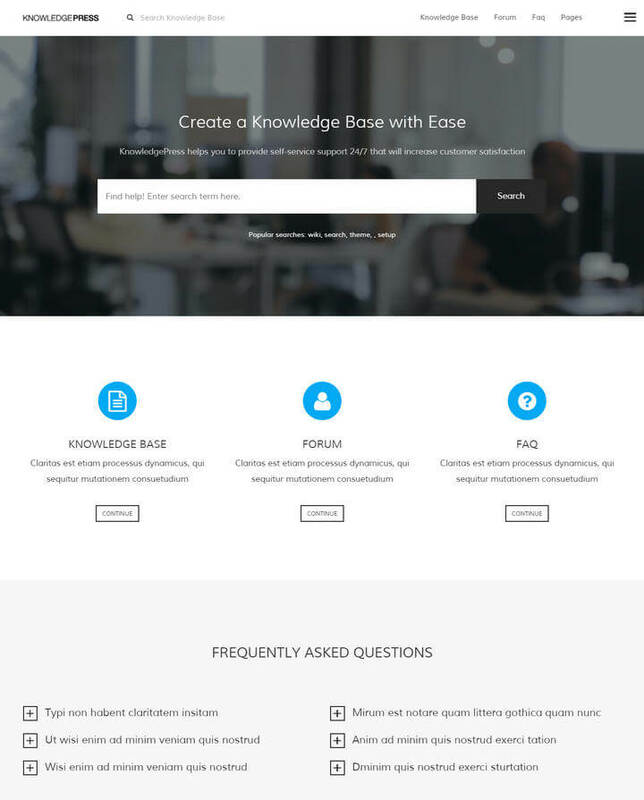 Knowledge Base is a very popular WordPress plugin for adding fully functional wiki, support or knowledge base feature in your website. With the help of this plugin, you can add a comprehensive helpdesk for your products or services. You can provide both in-depth articles and quick, short answers to specific questions. The drag and drop interface of the plugin makes it very easy for you to reorder the posts and categories in your wiki section. It is also possible to set up custom slugs for the posts and categories in your support site. The handy breadcrumbs will provide a clear idea about where the visitors are right now. What’s more, you can allow the visitors to like or dislike support entries. As a result, you can find out what type of content you need to provide more and what type to avoid. The translation-ready plugin also comes with full documentation. You can get the plugin for $25. If you are looking for a professionally developed plugin to add wiki or support section in your website, BWL Knowledge Base Manager could be an excellent choice for you. This plugin comes with six different layouts including numeric list, custom icon list, boxed style and accordion style. Once you have chosen a style, you can start adding support entries instantly. The fully responsive grid system of the plugin allows you to create one, two, or three column layouts for your support section. 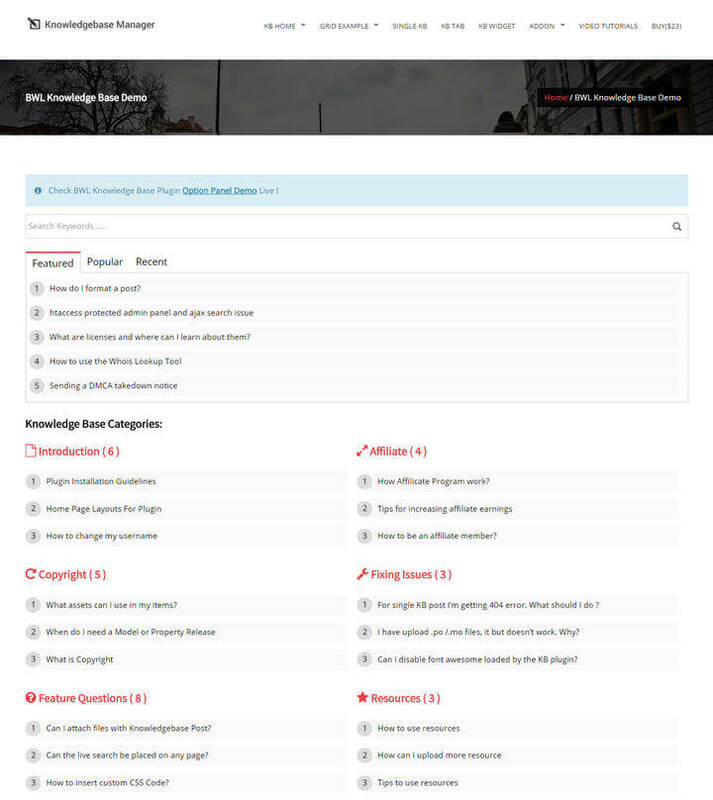 The AJAX-powered search system provides instant answers as a visitor types the question. You can easily keep your support entries organized by using the knowledgebase tags and categories. The plugin also comes with the related questions feature, which enables the visitor to know more about their queries. Depending on the usefulness of the article, they can upvote or downvote the entries. There are 5 custom widgets to use in your footer or sidebar. The WPML-compatible plugin also features custom shortcode and custom CSS. This plugin is priced at $23. 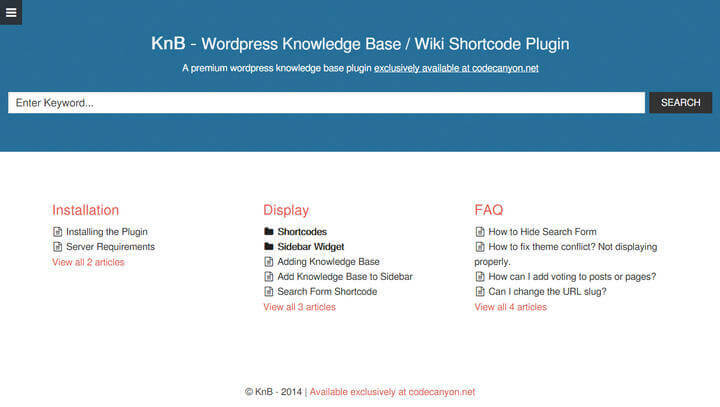 Featuring lots of handy shortcode, the KnB – WordPress Knowledge Base plugin provides an easy way to add support, FAQ or wiki sections into any part of your website. The built-in shortcode generator enables you to create custom shortcodes by choosing the display, ordering, layout, and visibility options. The integrated voting feature will allow the visitors to express their like or dislike of the support entries. The custom widgets make it easy to showcase the latest, most popular, or top voted wiki items in your sidebar. It is possible to customize the wiki layout to match your existing website design. The category and sub-category support means you can manage your support entries in an organized way. The search shortcode could be used to add a search section in the header or in the sidebar. Being fully responsive, KnB works perfectly in any screen resolution and in all modern web browsers. You can get the plugin for $19. Powered by a fully featured front-end editor, UserPress is a smart Wiki management plugin. 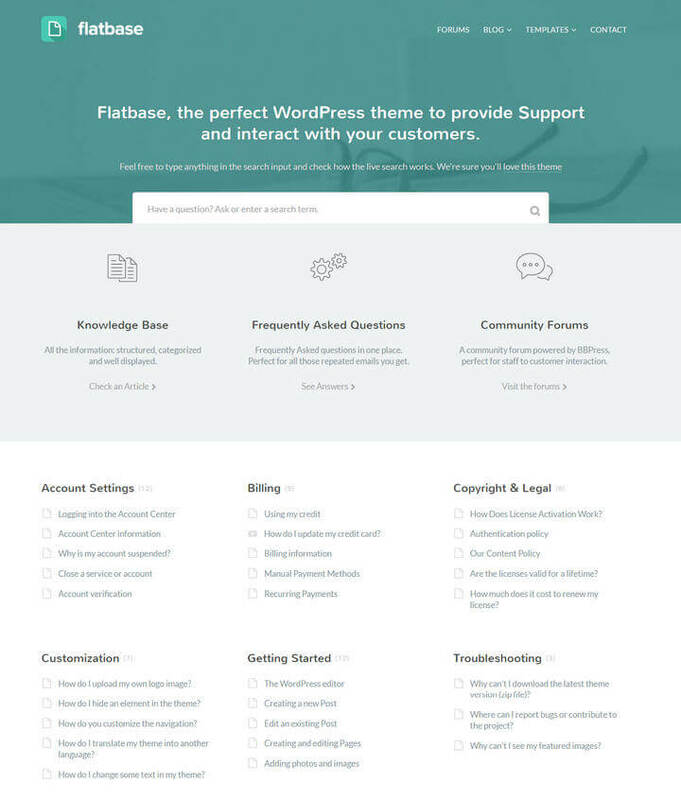 This premium WordPress plugin enables you to include a dedicated support section in your existing website. You can also allow the visitors to add or edit content without registering. For more sensitive contents, you can set page-specific permissions. While the plugin works with any WordPress theme, it is possible to customize the appearance to match your existing design. Thanks to the integrated iFrame support, your visitors can visit any linked page without opening that in a new tab. The archives and sorting features enable you to keep the content organized. As the plugin keeps a full revision history of each entry, it is possible to compare the changes and allow or remove any change. Any suspicious entry could be flagged for further analysis. The plugin works perfectly with all the popular WordPress plugins. You can get UserPress for $33. So, these were the best theme and plugins to create a Wikipedia like site in WordPress. Each of these is equally capable of creating a fully functional wiki site or adding a support section in your existing website. Let me know which one seems most interesting to you. If you have any other tips to share, feel free to do that by leaving a comment below. And if you find the post useful, don’t forget to share it in Facebook and Twitter. WordPress Vs Blogger : What Bloggers Think is The Best? What is the advantage of using Wiki by WordPress over MediaWiki?